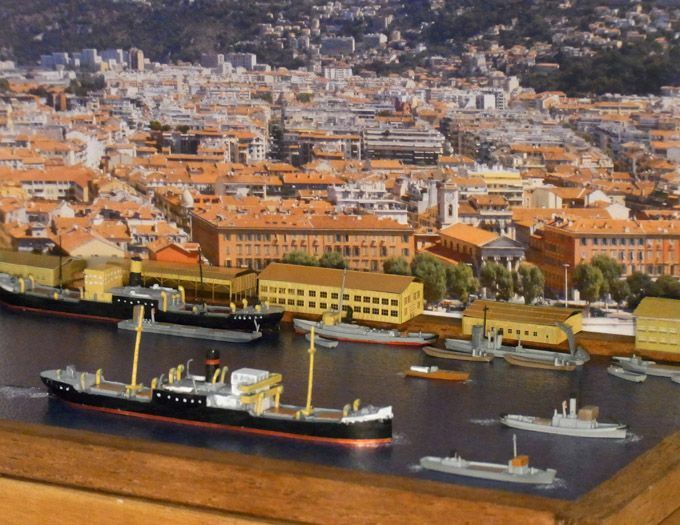 Well, the old tramp steamer pictured here being welcomed into harbour by a few tugs is the resin model. I found a German outfit who makes the basic resin kit on eBay. 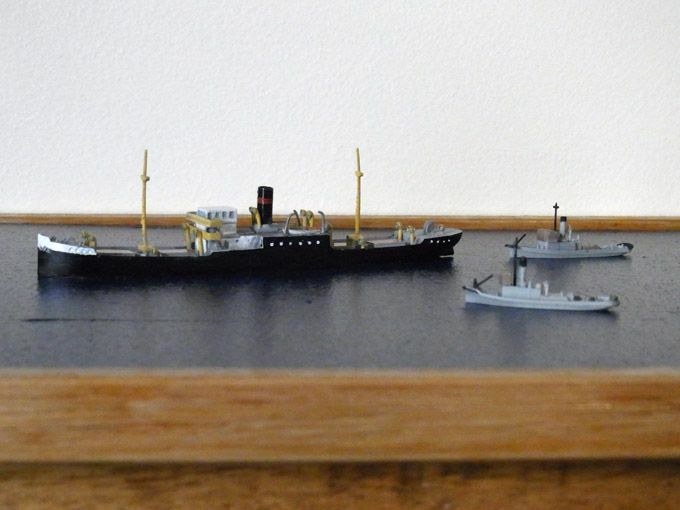 The little tugs are plastic, part of a wonderful 1:700 "Tugger Set" made by Hasegawa that includes 3 tugs, a number of small motor boats, a fuel oil carrier, water carrier and several other military-era specialist vessels such as an aircraft rescue ship (complete with crane). Incredibly, the little Hasegawa Tugger Set cost $6.70 plus $6 postage. The resin steamer cost about $30 plus $15 postage. 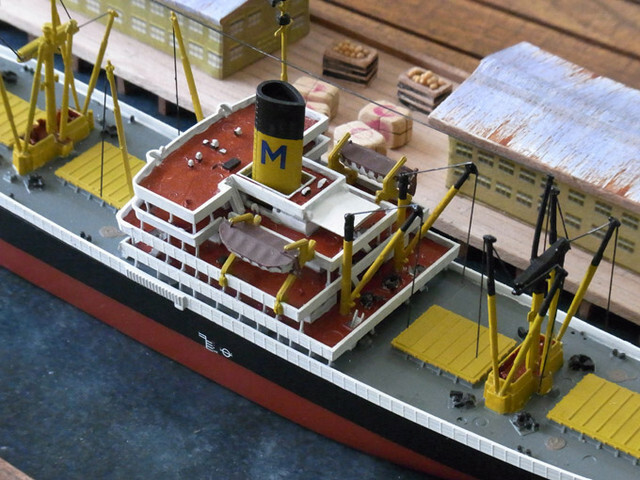 I haven't finished all the Haswegawas, and by the time I have done that a set of 1:700 scale harbour side buildings should arrive in the post, to complete the diorama. And I'm rather proud of my first attempt at modelling very smooth harbour water. I won't try fancy effects like wakes until further down the track. I've always loved the era and stories surrounding tramp steamers and all those freighters of the era 1910 to 1960. I have a Revell 1:380 kit of a freighter called 'Hawaiian Pilot' ready to amuse me sometime next year. There seems to be very few old-time freighter kits around. 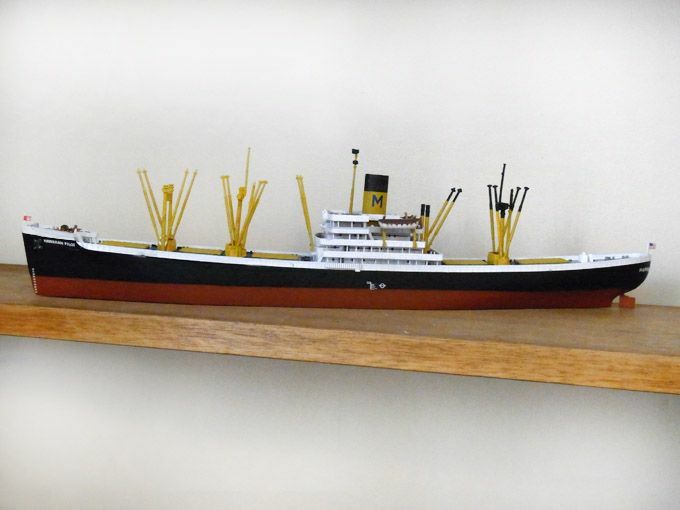 There are some Liberty ship kits readily available, so if you know of any other source of old-style freighters let me know please! Last edited by Ozmac on Thu Feb 20, 2014 9:01 pm, edited 1 time in total. Re: Ahoy, shipmates - a Tramp Steamer diorama. Meanwhile, here in this murky backwater of the S143 forum, I've been cruising on regardless with my first-ever 3D (ie, not Photoshopped) diorama, of my 1930s tramp steamer ship coming into port. 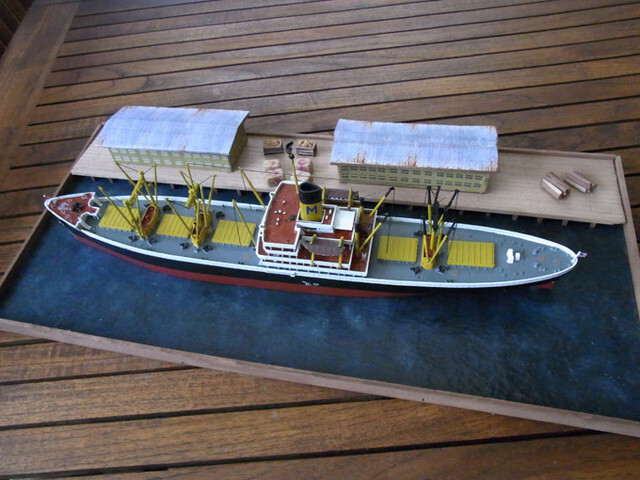 Here it is, complete with a gaggle of 1:700 scale port tugs and other harbourside service craft. 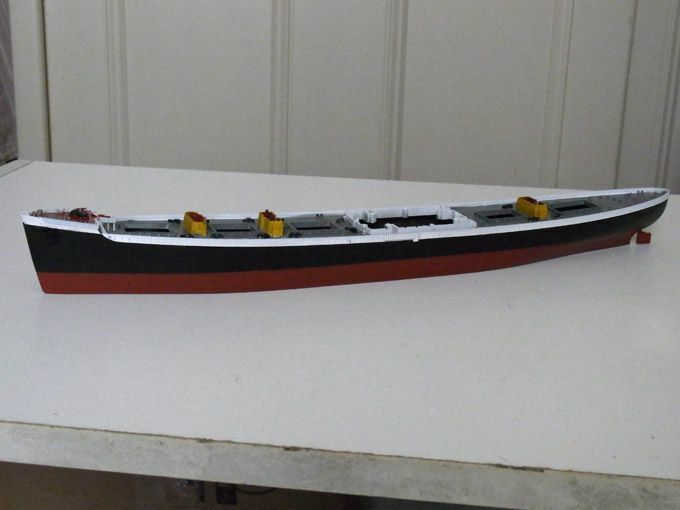 I also had a spare hull for the tramp steamer, a knocked around one damaged in transit (which the supplier replaced). So I made a few bits and pieces for it, painted it up and put in in the background, as another tramp steamer unloading at the dock. 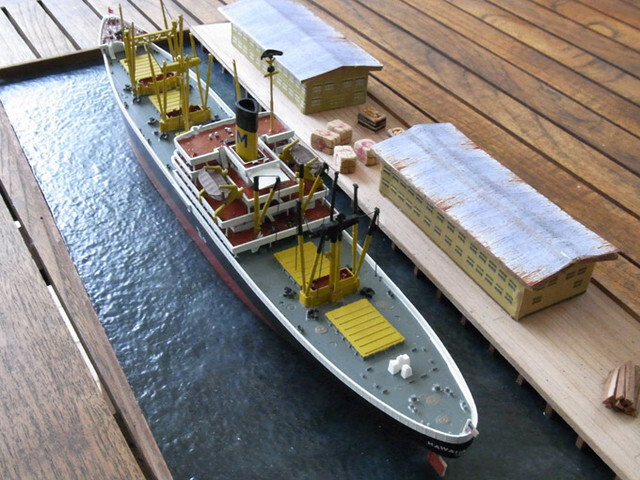 I also found a guy who makes 1:700 scale harbour side warehouses, so I added them as well. Nice little job that Jamie. Do I see bow waves and wakes in the water now? Where is the backdrop - looks very Mediterranean. Wonderful overall effect. Great job on the water and on the transition to the backdrop. Well-spotted, Dave, that's Nice in the background, and thanks for the kind comment, RT. Another area I really need to steer clear of. Working boats are very interesting to me. Looks like a fun setup that really looks the part, well done. If I wasn't an ugly old bald bloke with a beard, I'd be a temptress. It comes together really well in the diorama. I like it a lot. 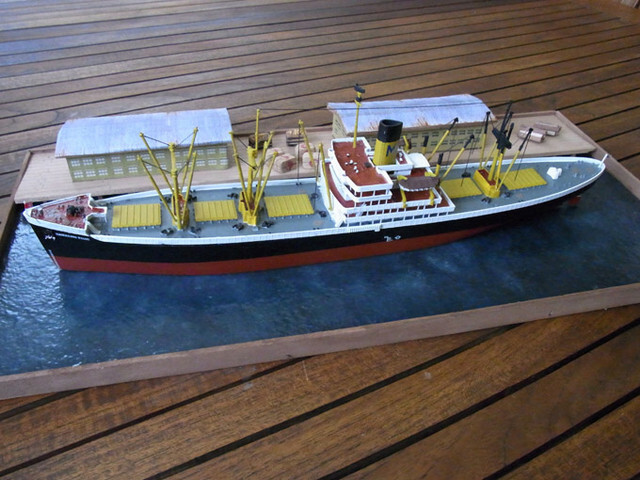 It hasn't been too hard or especially expensive to find old Revell kits of working ships. I'm very slowly building the Hawaiian Pilot on the many slow days when no-one wants to employ me. The Esso Glasgow tanker is the more sought-after kit that took some snappy eBay bidding at the close to get it, but I still got it for under $30, plus postage. And I didn't go looking for spy trawlers. 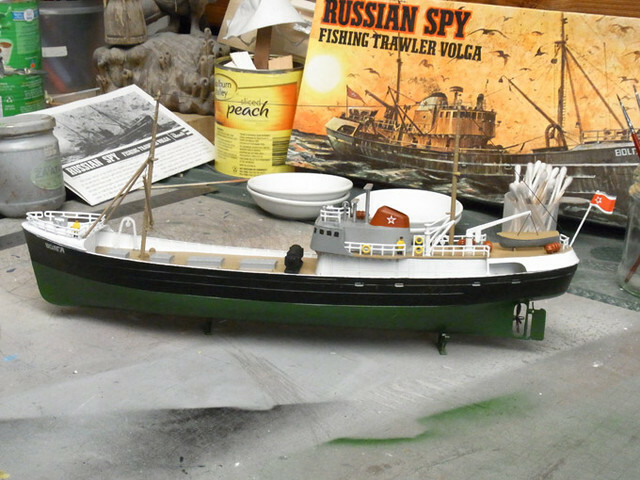 This one came up on eBay because I was searching for "fishing trawler" and I thought a spy trawler would be just as fishy as any other trawler. When I say "slowly building" I mean slow. Here's the Hawaiian Pilot with the hull and deck painted, all glued together. 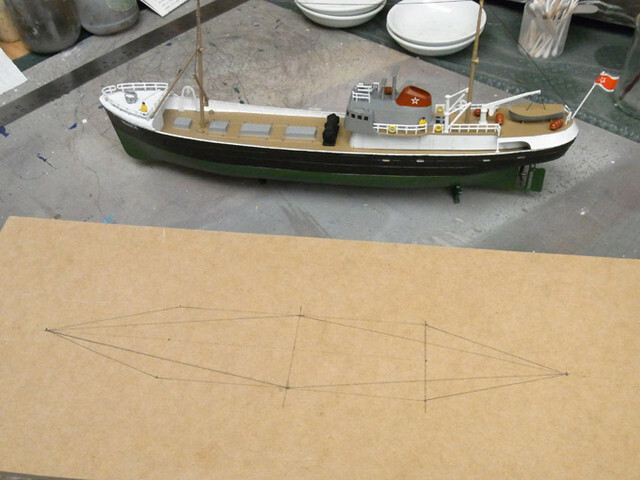 Lots of fiddly little steps, derricks, rigging and of course the superstructure to come yet, but it passes the time very nicely, and I've been reading up on these ships along the way, which is all part of the fun. It already looks good to me, I am not much of a "do a little bit each day" kind of person so I really admire someone who can continue to make progress. Well, until I learn how to attach rigging to plastic models, this is where I'm at with the mighty 'Hawaiian Pilot'. As I suspected with such an old model kit (I think it's from the 1980s) the decals were made of disintegratium. I managed to salvage enough for a "good side" but alas, the city from which it hails, San Francisco, is now a little known port called 'Francisco'. As for how to attach rigging, I still don't have a clue. I'm watching YouTube vids galore and Googling the topic as well, and one of these days all those winches and cranes will have little black threads in the right places. I'm setting myself a 2016 target on that one, though. Adding the Bridge makes a ton of difference. It's about 37cm (15 inches) long, Jeff. Interestingly enough, an old friend of mine, to whom I sent this photo this afternoon, said it reminded him of the 'Sonoma', which visited Sydney regularly in the 1960s. And the Hawaiian Pilot was renamed the Sonoma, so he has a good memory for ships. You friend has a long memory. And so I finally figured out a way to (sort of) do the rigging on the Hawaiian Pilot. Well, it's token rigging, a few wires here and there in strategic places. For real authenticity it'd be another hundred or so to go. And my token rigging was hard enough to get right. And then I thought to myself: "It needs a diorama. My Tramp Steamer has a diorama, the Hawaiian Pilot needs a dio, too." And so I've built myself my second 3D (ie, non-photoshopped) diorama, of the Hawaiian Pilot sitting at the wharf, waiting to take on a few small loads from some small island port. Thank goodness for craft shops and balsa wood, that's all I can say. Go on, ask me how I did the water… OK, then, if you insist. Spotted a YouTube vid on how one master waterside diorama maker does his water, and I'm pleased with this first attempt. Four colours underneath: black, dark blue, dark green and white, all stippled on to create a blotchy effect. Then 10 coats (yep, count 'em, 10) of a nifty craft glue called Mod Podge, which you also stipple on with a fat, blobby brush. It goes on white, dries clear. One coat of Mod Podge each morning, for 10 days. Then a few coats of clear, gloss sealer to finish. In the right light, at the right angle, it looks like water! Finally, I am very proud of my two crates of coconuts. In this case the coconuts are actually white mustard seeds. I also created some 'bales' of something, bound by 'wire' (hot knife edge burnt into the balsa), plus a few piles of lumber. I am also bidding on a few 1:300 Russian Zil trucks, and hopefully if I win them, one or two of them will make it onto the wharf, if they don't look too out of scale. The ship is 1:380, so I'll have to wait and see. And so, this first stab at diorama building has given me confidence to have a go at a diorama with cars. I'm thinking a street scene somewhere…. haven't got a scenario clear in my head yet, but if it isn't French I'll be surprised! The water does indeed look realistic. Looks excellent! I admire your skills and the results must feel quite rewarding. Everything comes across very well. Not just in execution but in style. Water is very convincing. I love it! Water surface is really convincing, love the weathered rooves on the buildings, the cargo... excellent job! I bet it feels good to look at it knowing that you made it yourself! Kudos for your water. I like those rusty roofs. Good creativity for the cargo. Looking forward to seeing the trucks on the dock. I have one model ship kit (my first) that I haven't built yet. It's a Billings Boats model of a two-mast Danish ship. I suppose it will mean learning some new modeling skills that weren't needed for my white metal and plastic kits. In Denmark, and in coastal areas of several other European countries, model sailing ships are hung from the ceilings of churches. (I don't know how they keep them from getting terribly dusty.) Some of these models are quite remarkable. I hope to display mine on the fireplace mantel. However, it's spring time here, of course. That means lots of yard and garden work – less time for model building. Here's the kit built close to completion (some touching up of paint here and there needed). 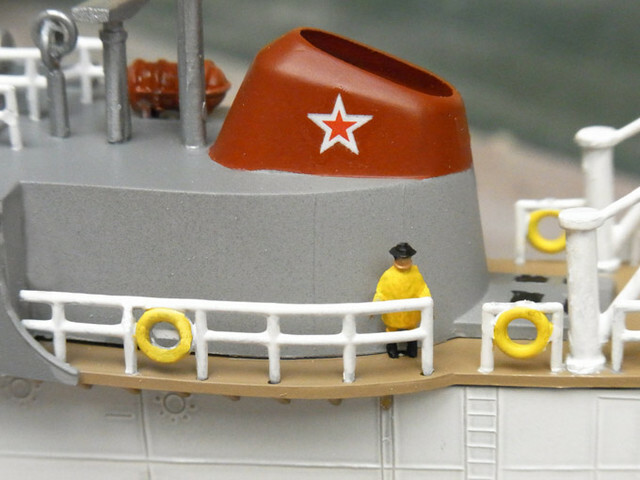 I did like the inclusion of two little Russian spies (er, I mean fishermen) in the kit. However, as I don't like the "full hull" look of the model, or the crappy plastic stands it is temporarily sitting on, I have decided to create some more water effects. This time I am going to attempt my first "wakes" and "choppy seas", sitting the ship into the water via a cutout at the waterline. Should take weeks, at the earliest.